The love of tomatoes knows no borders. The south of Italy and the American south are kissing cousins when it comes to their love of tomatoes. But, as chef and author Miriam Rubin relates in her new cookbook Tomatoes (University of North Carolina Press), the fruit once feared as inedible is native to neither the mezzorgiorno nor the American southland. “[Tomatoes] come from South America. They were adopted by the Mayans and Aztecs, and then by the Spanish conquerors, who took them to Spain. From there, they spread to Italy and the Mediterranean. Then, through explorers, settlers, and in the pockets of immigrants, they came to the southern United States,” says Rubin, whose food and gardening column “Miriam’s Garden” appears in the Pittsburgh Post-Gazette. 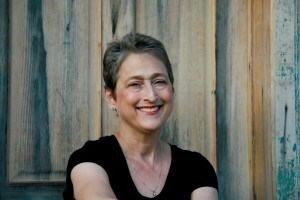 With her charming and informative prose, plus fifty vibrant recipes, Rubin paints a passionate portrait of the tomato. She offers a bushel basketful of tips and techniques for storing, preserving, and just plain savoring many varieties, including heirlooms such as Brandywine and Cherokee Purple. She even offers exciting options for canned and supermarket hot-house tomatoes. 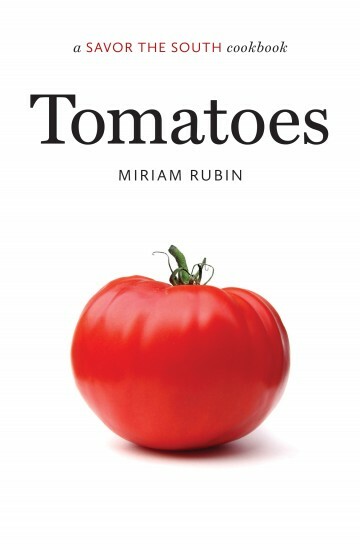 Author Miriam Rubin cultivates tomatoes in her Greene County, Pa. garden. Now is the time to plant your tomatoes. Tuck away this recipe for Sungold Tomato Sauce and in two months, you’ll thank Rubin with sweet juice dripping down your chin. Sungold cherry tomatoes, the tangerine-hued, juicy-sweet pops of flavor, are tops on everyone’s list. They’re also easy to grow, but be sure you have the space because the prolific plant can reach over six feet tall. My newspaper editor’s young son, Jesse, loves them, and like a deer, he will eat a plant bare. This sauce is on the thin side, so it is best tossed with a spoonable pasta (this recipes makes enough sauce for 1 pound), such as elbows or orzo, and served in bowls. Whole wheat pasta is especially good. Maybe cook some tiny peas or thin pieces of asparagus with the pasta for a minute before it’s drained. Heat the olive oil in a large, deep, heavy skillet over medium-high heat. Add the garlic, oregano, and crushed red pepper and cook, stirring, until the garlic is fragrant, 2–3 minutes. Add the Sungold tomatoes, yellow tomatoes, and salt; bring to a boil. Reduce the heat slightly. Cook, stirring and mashing the tomatoes with a spoon, until they are very soft and have cooked down, about 10 minutes. Put the sauce through a food mill suspended over a narrow pot or press it through a fine-mesh strainer, leaving only the skins and seeds behind. 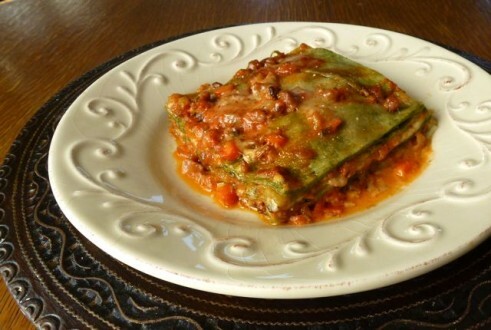 Reheat to serve, stir in the parsley and mint, and taste for seasoning. I must have a copy of this book! Thank you Sharon! Fabulous post. You make me look and sound so good. I’m so thrilled with this.